I had never cooked lamb before but decided it was high time I checked this off my cooking bucket list. Honestly I was a little embarrassed I had never even attempted it. Plus with the tzatziki I made yesterday hubs and I were clearly having a Middle Eastern themed meal and I tend to think of/crave lamb shwarma. I found an interesting recipe from my buddy Deb Perelman in her wonderful book The Smitten Kitchen Cookbook called Pistachio Masala Lamb Chops with Cucumber Mint Raita. I decided to try following, “mostly,” the directions for her lamb chops. First I made friends with Michael who works in the meat section of Stop & Shop. We talked meat and Red Sox and next thing I knew he was out back finding me the best and freshest lamb chops. Well done Michael. I know everyone thinks we live in a digital age but I still think you need to talk to real people to get the best (best deal on cable, best understanding of your health plan, best lamb). Social skills are highly underrated. Next – the international section. Perelman’s recipe called for a special Indian spice called chaat masala. She makes a big deal about why it’s so important and usually I never buy somewhat esoteric ingredients but figured I would look. I made another new friend – a representative from McCormick who was in Stop & Shop organizing/checking their product display. He came and found me a few aisles away to give me something called Garam Masala. It sounded pretty similar so I bought it. However, upon arriving home and googling garam masala everything I read talked about how different it is from chaat masala. Ok maybe owning a smart phone would have been convenient in this situation… but I still refuse to give in to The Man! I didn’t end up using the spice and am going to return it today when I go to buy ice from Stop & Shop for the hubs’ Ice Bucket Challenge to support ALS. -shelled pistachios (plain/roasted) I bought a bag. My father-in-law loves them so the leftover will definitely get eaten. Preheat your oven to 425. Have a baking sheet or roasting pan (what’s the difference?? Perelman said roasting pan… I used my baking sheet) ready. 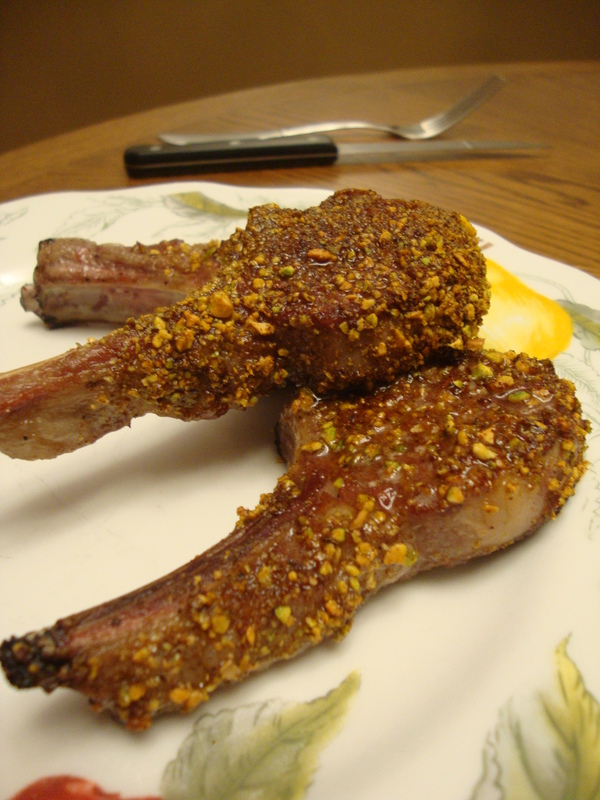 Take your lamb out of the fridge and coat generously with salt and pepper on both sides. Let it sit for at about 10-15 minutes while you prepare everything else. Remove pistachio shells (hubs or kids can do this for you). I think he shelled about 20-25 nuts. A small bowl full. Using your food processor pulse the pistachios, paprika, cayenne and cumin together until it is about the consistency of panko or bread crumbs. Smell deeply. Mmm. Pour this mixture back into your empty nut bowl and set aside. Coat a skillet or saute pan in olive oil and heat over medium-high heat. If the oil starts to smoke turn it down a little. 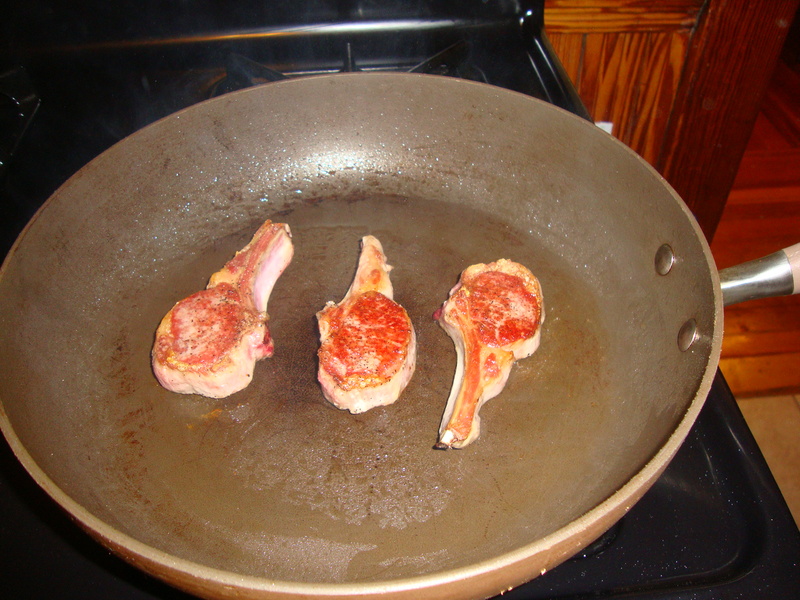 Place your lamb on the skillet and sear both sides for 2 minutes. I only did 3 lamb chops the first time and then did 2 after that because I didn’t want to crowd the pan with such a delicate meat. 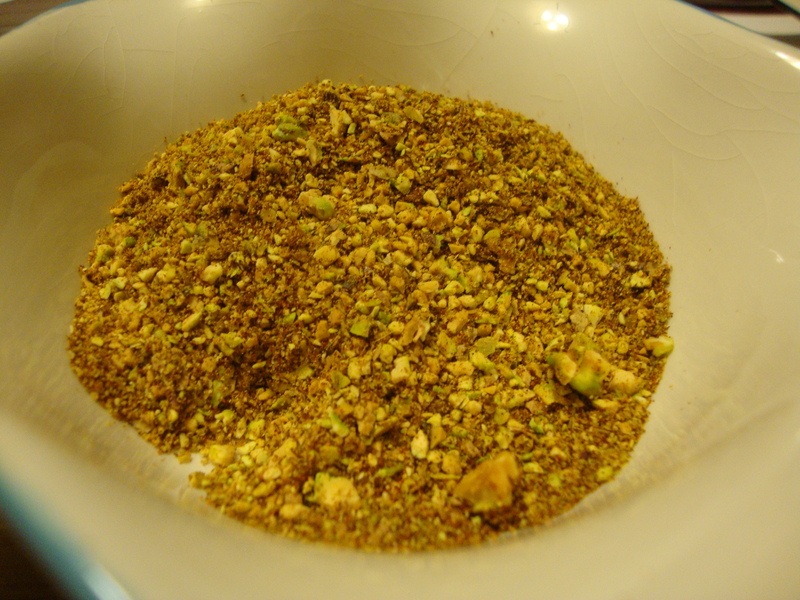 When you remove the lamb from the skillet dip it in the pistachio mix. Place on your baking sheet. 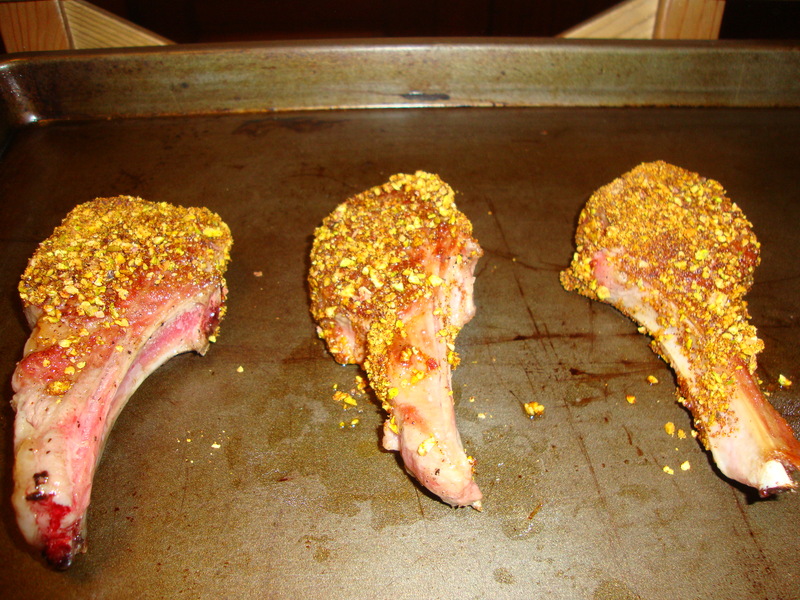 Once all the lamb has been seared and dipped in the mix place it in the oven for 5 minutes. My lamb was definitely cooked through, but not overcooked. I probably seared mine for 2.5 minutes and had it in the oven a little closer to 6 minutes. If you want it more rare stick to 2 minutes max on the sear and probably 4 minutes in the oven. What is nice about this meal is there is a lot of flavor and it looks really fancy, but it really doesn’t take much time at all. This could be a nice meal if you want to impress a dinner guest too. We ate the lamb with pita and various dips (baba ghanouj, hummus, cucumber yogurt, tabouli) but it could also be nice on a plate of risotto or polenta.